To understand waste, fraud and abuse of taxpayer dollars in the Medicaid system, let’s begin with a couple of basics on what the role of Medicaid is in health care and how it works. Medicaid is a program for people who cannot afford health care that is dually funded by both the federal government and states. (Medicaid is different than Medicare, which has no state dollars and is fully funded by the federal government for those over the age of 65.) In Texas, we spend about $30 billion dollars a year on Medicaid – almost a quarter of the entire state budget. Over 3.7 million Texans are enrolled in Medicaid in Texas and one-third of them are children. Patients enroll in Medicaid through HMOs. For patient care, the Texas Health & Human Services Commission (HHSC) sets standards for Medicaid by determining who is eligible, what services are covered and what the state will pay for those covered services. HHSC then reimburses doctors, dentists, pharmacies and other downstream services like home health care directly by paying them for covered services delivered to eligible patients. At the federal level, the Center for Medicare & Medicaid Services (CMS) reviews the state plans to make sure states are balancing payments that enlist providers who are efficient while providing patients with quality care. Because there’s so much money involved in Medicaid and because the system is so complex, the opportunities for fraud seem endless – billing for services not rendered, double billing, deliberate upcoding (charging more while delivering less), generic drug substitutions, electronic medical record identity fraud and kickbacks are just some of the scams. Then there’s the waste – waste that comes from redundant care and as well as the way services are billed and how the system is structured. Redundant care means providing the same services for a patient that have already been done before – like more X-Rays, more tests and extra visits to the doctor. According to the federal Office of Inspector General (OIG), Texas has the highest number of Medicaid fraud investigations nationwide, so even a modest recovery of improper benefits could yield a tremendous savings for Texas taxpayers. With so many care providers, medical institutions, pharmacies, drug manufacturers and patients plus the perception of easy money and a low likelihood of getting caught, how can states stay ahead of the scammers? 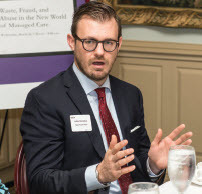 In conjunction with sponsor Grant Thornton, Texas CEO Magazine sat down for a roundtable discussion with experts about Medicare waste, fraud and abuse and what can be done. Despite political differences, there was much in common when it came to solutions. 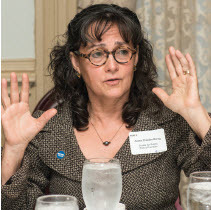 Kay Ghahremani directs the program side of Medicaid for Texas from inside the Health & Human Services Commission and spoke about what HHSC is doing to attack the problem. Because of the Affordable Care Act, states are now required to re-enroll all providers. “We have providers who came into the program 20 years ago and we haven’t taken a look at them since,” said Ghahremani. As a result, there is now a massive re-enrollment program for all the providers, from durable medical equipment to home health agencies, and HHSC is also re-enrolling hospitals and physicians with national databases being crosschecked to make sure a provider hasn’t been un-enrolled from another state. The Texas Office of Inspector General (OIG) is part of HHSC and intentionally separate from Ghahremani’s program side of Medicaid. The Inspector General is appointed by the Governor and OIG’s role is to detect, deter and correct Medicaid fraud, waste and abuse. Representative John Zerwas, who is a physician and a member of the Appropriations Committee of the Texas House, would like to find a way to better identify fraud upfront and prevent payments from occurring to begin with. “We have yet to identify ways we can effectively intervene before the dollars go out and invest in the people who recoup those dollars,” he said. 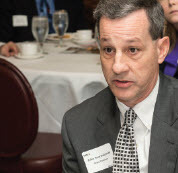 Federal CMS data collection is already improving drastically, said John Scornaienchi of Grant Thornton. Scornaienchi is based in Washington and sees the data regularly. “At CPI-CMS (Center for Program Integrity – Centers for Medicare & Medicaid Services) it used to be they weren’t quite sure how waste, fraud and abuse and improper payments were doing across the country because the information was old,”he said. Now, with more real time information and claims data, CMS has a sense of how things are doing and Scornaienchi says the statistics are improving. 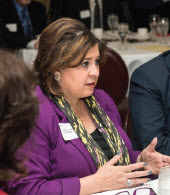 Senator Leticia Van de Putte is a pharmacist from San Antonio. Van de Putte sees a wide net being thrown over all of the providers – adding more process to the complexity and the cost of health care and employing more people to handle administrative work than direct care. controls that create hassle after hassle after hassle,” Van de Putte said. Public Policy. Dunkelberg sees countries with excellent health care like Germany and Switzerland spending dramatically less per person and covering almost everyone with better outcomes. The implication? There might be waste in the U.S. system. John Hawkins of the Texas Hospital Association. “Our state leads the country in readmissions to hospitals, 30 days post-discharge . . . talk about waste, fraud and abuse, that’s the real cost driver,” Van de Putte asserted. She said the legislature needs to address the issue. “We need to come to the table to figure out how to reduce costs and respect taxpayers in a way to be more productive,” she said. 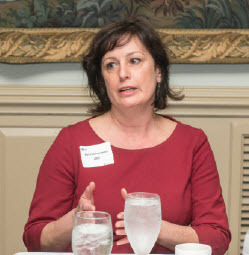 Representative Zerwas said if the provider group as a whole – hospitals, doctors and pharmacists – were working toward providing the best outcome, we would start to see a system driving that cost down from $8,000 per person to the $5,300 and below – with better quality. 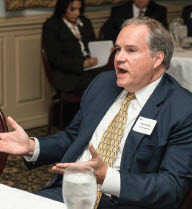 For Hawkins, “The real opportunity is not in ‘pay & chase,’ but the real opportunity is to look at payment reform to drive better behavior in the long run.” Hawkins said the fee for service system has put the providers in silos where they are trying to maximize their own piece of the puzzle – especially in an atmosphere of reduced payments. John Davidson of the Texas Public Policy Foundation echoed that sentiment. “Payment reform is really the lynchpin to getting at Medicaid waste, fraud and abuse,” he said. Davidson wants consumers to be more involved in their own care and to know what’s being paid for. By divorcing the cost from the consumer who doesn’t know who’s paying for what, Davidson sees a limitless possibility for providers to commit fraud. “I keep wondering how these duos pull off $5 million in fraud. Obviously it is far too easy to slip under the radar and game the system when none of the people receiving care are paying attention to the payment system, at all,” he said. In Texas, the Medicaid program is, for the most part, operated by HMOs that are required to have investigative units that report to the OIG. In Texas, unlike most other states, once fraud is detected and there is a collection, HMOs get keep those dollars. “There’s an incentive on the part of the HMOs to look for fraud and abuse. If they have providers who are bad actors, they drop them out of their networks,” said Ghahremani.